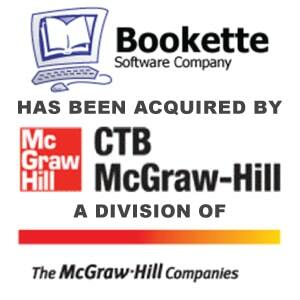 Berkery Noyes Represents Bookette Software in its Sale to McGraw-Hill Education - Berkery, Noyes & Co., LLC. New York, March 3, 2011– Berkery Noyes, a leading independent investment bank serving the education, information, and technology markets, announces that it represented Bookette Software, of Monterey, CA, in its sale to McGraw-Hill Education. Bookette Software is a leading provider of quality software products and solutions that meet the needs of teachers and administrators in the management of assessment information to facilitate academic improvement. Bookette specializes in the development of scalable software to build, administer, score, and report on-going assessments for schools, districts, states, and worldwide education systems. Financial terms of the transaction were not disclosed. “Bookette Software has been a leader in developing highly innovative assessment solutions for the education marketplace. The combination with McGraw-Hill Education will help expand the Company’s current footprint and will strongly benefit students as the demand for digital testing and assessment solutions continues to grow in the K-12 market,” said Vivek C. Kamath, Managing Director of the Education Practice at Berkery Noyes. Berkery Noyes initiated the transaction on behalf of Bookette Software, acted as its exclusive financial advisor, and represented it in its negotiations with McGraw-Hill Education. Berkery Noyes provides strategic mergers and acquisitions transaction advisory services, financial consulting and strategic research to middle-market education, information and technology companies in the United States and internationally. Berkery, Noyes has been involved in many notable transactions in the media and information sectors, including the merger of Compass Knowledge Holdings with Embanet, Rockbridge Growth Equity’s acquisition of NorthCentral University, Interwrite Learning’s acquisition by eInstruction, Global Scholar’s acquisition of Excelsior Software, Macmillan’s acquisition of Hayden McNeil, and Leeds Equity’s acquisition of Ex Libris. For more information, visit: berkerynoyes.com. CTB/McGraw-Hill has an 85-year record of innovation and excellence in assessment, and serves more than 18 million students in all 50 states and in 46 countries. CTB/McGraw-Hill is part of McGraw-Hill Education, a division of The McGraw-Hill Companies (NYSE: MHP). McGraw-Hill Education is a leading global provider of instructional, assessment and reference solutions that empower professionals and students of all ages. For more information, visit CTB.com. Bookette Software, located in Monterey, CA, specializes in creating software for the development, administration, scoring and reporting of computer-based curriculum assessment. It was founded in 1990 by Dr. Ronald Loiacono using the knowledge and experience he had gained as one of the pioneers in using technology as a way to assist educators to assess and improve learning. For more information, visit http://bookette.com. Buyer Parent: The McGraw-Hill Companies, Inc.